The Northern California mega-region ranked extremely high in per-capita income growth in 2015 according to the latest data from the BEA. As shown in the table below, 10 out of the 11 metro areas ranked in the top 10% of the 382 metropolitan areas in the U.S. for growth in per capita income, and even the lowest ranked area, Merced, was in the top 20% of the U.S. The table shows huge disparity in per capita income across the region, and if you dig deeper in the data you can also see big changes in the composition. One thing they all have in common is that at least some of the growth is radiating out of the income-generating engine of Silicon Valley. Between 2013 and 2015, the net change to the "adjustment for residence" (wages earned in one metro area by a resident of another) in Santa Clara County was -$8.1 billion. The largest share of that commuter income fell into San Francisco and the East Bay, but these commuter gains are also driving a large share of income growth in places like Modesto. Another big difference between the inland areas and Silicon Valley was the large importance of government transfer payments (primarily in the form of health insurance subsidies through Obamacare), as well as government and healthcare employment to income growth in the Central Valley. Since so much healthcare spending growth is related to government programs, I have combined transfer payments, and earnings from government and healthcare employment in the table below. As shown in the table below, there is a stark contrast between the metro areas. Share of 2013-15 income growth from government transfer payments, and wages from government and healthcare jobs. Merced and Stockton have particularly high growth because of expansions at UC-Merced, and the new CA Healthcare Facility for corrections in Stockton. But the common element of all of these is that at least half of the total is due to Obamacare's expansion of Medi-Cal and private insurance subsidies. While we don't know when or how much healthcare will change as a result of the election, it is clear that the economic impacts will be felt the most in the Central Valley. Below is what I wrote in the Center's economic forecast about 6 weeks ago. It still reflects my thoughts. If Donald Trump is elected, the near term economic effects are highly uncertain. If he were to follow through on promises to impose tariffs on certain imported goods, threaten leaving the World Trade Organization, and restrict immigration, a Trump presidency would have negative effects on both the U.S. and global economy. However, other parts of Donald Trump’s proposals could stimulate the U.S. economy in the near-term and he is likely to want to do what he can to give the economy an immediate boost so that voters can feel the effect of his election. For example, he proposes a large tax cut, an even larger investment in infrastructure than Clinton, increased military spending without any offsetting proposals to significantly reduce government spending in other areas. If Congress were to go along with these elements of the plan, the economy would receive a near-term jolt from increased deficit spending while the federal debt would grow substantially over time. While stimulative in the short-run, the increase to the deficit will create long-run problems for the U.S. economy, especially considering that the current deficit is already very high by historic standards. Overall, the near-term economic effects of a Trump presidency are highly uncertain between the effects of global instability and domestic stimulus. However, the long-term economic effects of his approach are seen as negative in the view of most economists. While polls show slightly more voters trust Donald Trump over Hillary Clinton to manage the economy, no modern Presidential candidate has received less support from professional economists than Trump. Leading Republican economists who have consistently served as advisors to Republican Presidents, such as Martin Feldstein and Greg Mankiw, have publicly denounced Trump’s economic platform. Trump placed third behind Clinton and Libertarian Gary Johnson in a poll of the National Association of Business Economists. The Economist magazine lists his potential election as one of the top threats to the global economy. Trump certainly did not win over economists during the first Presidential debate when he criticized highly-respected Fed Chair Janet Yellen for “playing politics” with interest rates, raising concerns that he could try to reduce the independence of the Federal Reserve. I should note that the last forecast assumed a Clinton victory, so there will be changes in our January forecast. By then, we may have a better idea of how great the potential is for domestic stimulus in the near-term. A large tax cut seems a certainty, but will the Republican Congress go along with a big-spending Trump infrastructure plan? We may also have a better idea of the speed and extent of unwinding Obamacare; protectionist, anti-trade policies; and foreign relations. One thing is clear, the uncertainty over the 2017-18 economic outlook is much higher than it was a few days ago. As for the Valley Economy, there are a few additional issues that loom large. First, repealing Obamacare has the potential to have some significant negative economic effects in the Valley - you will be hard pressed to find a region that has seen a bigger change in the number of insured individuals and overall dollars flowing into healthcare. Health has been one of the fastest growing sectors of the Valley economy in regional years, and this could slow substantially. The agriculture sector could be hurt by a much feared "trade war." If the U.S. starts implementing tariffs on manufactured goods as Trump has threatened, U.S. agricultural products would be a likely target for retaliation from trading partners. Immigration changes could also affect agricultural labor markets. The industry is already facing serious labor cost challenges from rising minimum wages and overtime rules, but a sudden change to immigration policy could hit the agricultural labor markets even sooner. Some isolated parts of the Valley ag might see some benefits from relaxed environmental protection but the impact of these policies are actually much smaller than the political rhetoric around them suggests. The larger industry-wide issues of trade and labor will be more impactful. Finally, will the Valley see any of the much-hyped infrastructure wave. Perhaps. Tops on my list would be converting highway 99 to an interstate highway with a series of significant upgrades. How can a $6.5 billion farm subsidy to Central Valley farmers provide no benefit to Valley farms and the Valley economy? When it is used to subsidize the delta tunnels. For my detailed comments on last fall's Brattle analysis, reported by the AP today, see the memo I wrote that is posted on Restore the Delta's website. Restore the Delta surprised me late last week by sending me a copy of this report and related emails from their PRA request and asked for my thoughts. I wrote the comments memo over the weekend, and gave them permission to distribute it with the report. The big surprise to me in the Brattle report, was that it explicitly stated the need for federal subsidies, and then openly advocated for additional state subsidies. Coming from a state consultant, that is very newsworthy, especially given 10 years of public denials that there would be any public subsidies. In addition to the draft report RTD released today, I saw several similar drafts in the PRA documents that went back and forth between the consultants and the state last fall. The only substantive difference I detected in these drafts was the section with the weak rationalization of state taxpayer subsidies expanded in later drafts. So it seems pretty obvious to me that the state sponsors were pushing the consultant to find a solid argument for state taxpayer subsidies. However, the consultant was unable to develop a compelling case despite their best efforts, because there simply isn't one. It is important to realize that even if there is a combined $6.5 billion in federal and state taxpayer subsidies for agriculture's costs of the tunnels, the net benefit to farmers who would receive water from the tunnels is still zero. Add in the negative impacts on Delta farmers, and some risks for other farmers upstream from the Delta, and the tunnels are clearly a bad deal for the overall Valley economy. Why no net benefit? The subsidy would not pay all of agriculture's cost share for the tunnels - they are still responsible for $3-4 billion in direct payments for the tunnels even if the subsidy is $6.5 billion. Thus, the billions in costs that they would still pay consumes all of any water benefits they would get from the tunnels. The Valley economy has many, many needs. It breaks my heart to think that anyone in government would contemplate a $6.5 billion subsidy to Valley agriculture that provides no net benefit to the Valley economy. If such a subsidy were to happen, it would be a tragic example of ineffective and wasteful government. If the government feels compelled to spend billions in industry subsidies in the Valley, I would suggest spending a much smaller amount to entice some other industries that would diversify the economy and create good paying jobs. If a subsidy proposal is ever formalized, every mayor in the Valley should oppose it and offer up an alternative economic development package that is much cheaper and does more for their constituents. Three additional comments that occurred to me this evening as I read the AP report and some reactions to it. 1. Why did I say $6.5 billion in subsidy, when the AP and report only quotes $3.9 billion from the study? Two reasons: First, the $3.9 billion figure in the report is a discounted present value, so I have converted it to a $4.6 billion undiscounted value that is comparable to the estimated $16 billion construction cost. The other $1.9 billion is the amount of additional subsidy that would be needed to get the tunnels break even for farmers, and it is the reason for the extended discussion of additional subsidies for the project. So while the report does not assume a specific amount for state subsidies, the minimum amount of state subsidy the consultant is trying to justify is pretty clear. The AP reporter is just being careful to quote exactly what the report said about a federal subsidy, and she also notes that agriculture still comes up short. 2. Does Californians For Water Security have a secret financial plan for the tunnels? CWS's response reminds me a little of Donald Trump's secret plan to defeat ISIS. They said, the draft report "doesn't account for the latest thinking on financing the project." So, what exactly is the latest thinking? Please inform everyone. What exactly is the plan? If there was an actual finance plan for the tunnels, this "outdated report" wouldn't be so newsworthy. Tunnel advocates have no one to blame but themselves for not putting out a financial plan after 10 years. An information vacuum will be filled, and this is the best information available. 3. Doug Obegi's comments on the report are well worth reading. He highlights some additional points that I didn't discuss, and explains some other points in a different way that may be more understandable to some people. I wonder if all Modesto residents are really opposed to a regional airport? Through the Center of Business and Policy Research, I have been involved in studies of the North San Joaquin Valley which have identified opportunities for regional cooperation to improve economic development. One of the opportunities for regional cooperation is regional transportation infrastructure, such as regional efforts to improve air service - perhaps by combining resources through a regional airport - as well as regional efforts to improve rail transportation, transit and more. Thus, this article from Jeff Jardine in the Modesto Bee, http://www.modbee.com/news/local/news-columns-blogs/jeff-jardine/article97264652.html, a few weeks ago disapointed me. It quotes a number of folks in the Modesto area who dislike the concept of a regional airport and shows how hard it will be to really get people in the North San Joaquin Valley to see the benefits of greater regional cooperation and identity. The article rejects the idea of regional cooperation on an airport, and stokes unproductive regional rivalry by suggesting that people like me who suggest the concept of a regional airport are just trying to help Stockton to Modesto's detriment. It ignores the impact of subsidizing an airport on the city of Modesto's budget, and whether such ventures are better handled at the County level or through multi-jurisdictional JPAs. It defies location theory by suggesting locations in Merced or Modesto a few miles from highway 99 is a better location for a regional airport than adjacent to I-5 and 99 south of Stockton, arguing that it is more important to be far away from competitors than it is to be close and convenient for potential customers. Honestly, I don't think explicit cooperation or support from the rest of the North San Joaquin Valley is necessary for the Stockton airport to develop into a regional service center. If it stays on its current course of expanding service, I think consumers across the NSJV region will vote with their feet and wallets over time. In the long-run, I think the regional concept around the airport could work not just because of economies of scale and efficiency, but it could also be valuable in trying to develop a name that doesn't include the words Stockton and Modesto and use it as the basis for a new regional brand with fewer negative associations to outsiders than San Joaquin Valley, Stockton, etc.. I am not a branding guy, but I know enough that a regional brand is most likely to stick if it is authentic and connected to an actual thing like an airport. So, why not a regional airport in the NSJV that is not called Stockton-Modesto Regional but something like "NorCal Crossroads Airport" or "NorCal Gateway Airport" or "Zinfandel Airport" or many much better ideas that real marketing and branding experts can come up with. Now that is probably pushing an unpopular idea way too far, but it is a thought I have had. Farm Revenue Drops as Labor Costs Rise: Is the Era of Record Farm Profits Over? Two interesting news stories about California agriculture this week. First, initial estimates for 2015 farm revenue show revenues dropped sharply by $9 billion in 2015 compared to 2014. Second, a bill that would align overtime regulations for farm laborers with all other workers passed the legislature and is on its way to Governor Brown. If the Governor signs it, this will increase costs for farmers and comes just after the state approved large increases to the minimum wage that will likely have even bigger impacts on farm costs. A couple of graphs help put the news in perspective. 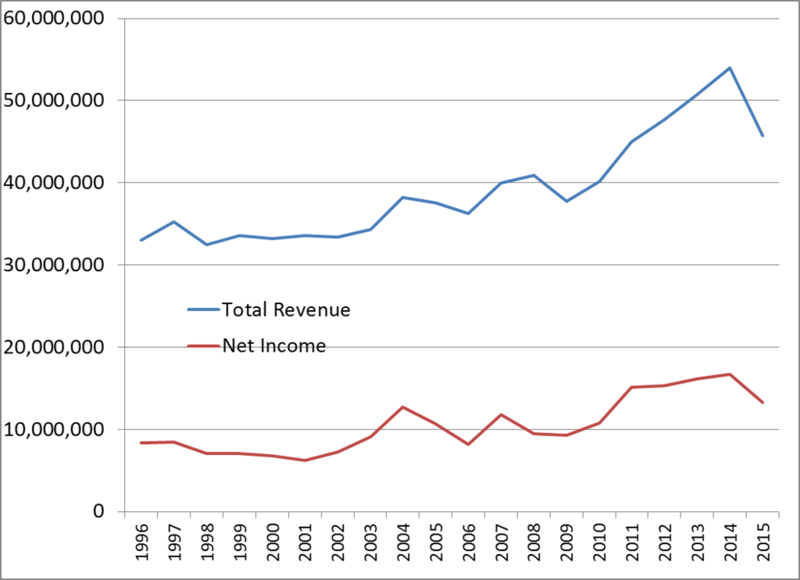 The first shows total revenue and the net income of farms in California over the past 20 years according to the USDA data series released this week. The data is adjusted for inflation, all values in 2009 dollars. 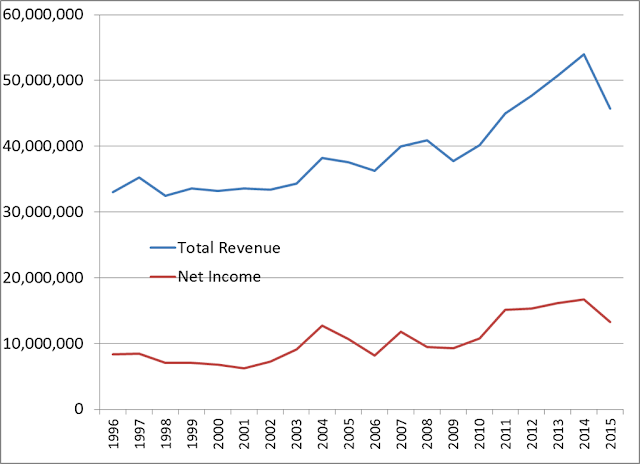 As the graph shows, farm revenue has increased sharply since 2011, and profits (net income) for the period of 2011-14 were at all time highs. While the 2015 results are down sharply from the previous year, they still look very good from this historical perspective. Expectations are for another decline in 2016, despite much less fallowing from drought. If the 2016 drop isn't too large, it may just be that farming revenue is returning back to trend growth after an anomalous 2011-14 period were prices were unsustainably high, and that nut prices finally came down in response to a decade of massive increases in production. 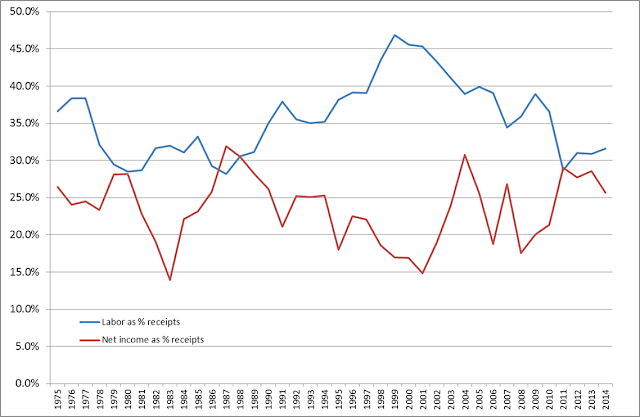 The next graph only goes until 2014, and shows labor costs and net income as a percentage of total farm revenue. In 2014, labor costs (the sum of farm employees and contract labor costs) was about 32% of California farm revenue, making it the largest cost category for California agriculture. This percentage varies significantly from crop to crop, with the highest labor costs for vegetables and fruits and the lowest for field crops. Historically, profit margins have been about 25% and labor costs about 35% but there are big fluctuations as farm revenue can be volatile. What will big changes in labor costs due to minimum wage and overtime regulations do to this picture. If nothing else changes (meaning farmers did not adjust their labor usage, crop choice, and technology as labor costs grow), the minimum wage increase and overtime regulation would likely push the labor share up to nearly 50% of revenue, and profit margins would drop to about 15%. Both numbers would be at or near records. That's a major shift, certainly enough to drive substantial changes in agricultural practices. There is going to be a lot of interest in labor-saving or productivity enhancing capital and technology investments in the agriculture sector over the next decade. That will reduce jobs, but should lead to better, higher-paying jobs. These are big changes for the Valley economy, and I think the changes will be mostly positive. However, I am concerned that the changes will be too much, too fast for Valley agriculture - especially as revenue seems to be coming back to normal. So what should Governor Brown do? I am very sympathetic to the overtime rule and aligning labor standards across industry. I don't see how the current rules can be seen as anything but discriminatory, so my views are the same as they were in this 2010 post when the legislature sent a similar bill to Governor Schwarzenneger. Having said that, I was alarmed that the minimum wage increase passed this fall did not allow for regional variation in the state like was done in Oregon. In my view, $15 per hour is too high for places like Fresno and Redding even though it may make sense in the Bay Area. There is a chance that the legislature could revisit this issue before the largest increases hit, and I would encourage them to make the $1 annual increases that begin in two years, 50 cent increases in inland regions so that the final phased in minimum wage is $12.50 not $15 in the Valley. I am not an expert in the political process and how negotiation between the Governor and the legislature work. I do know the outcome I would eventually like to see: a) minimum wage increase for the Valley adjusted from $15 to $12.50, and b) farmworker overtime regulations normalized to be aligned with other industries. 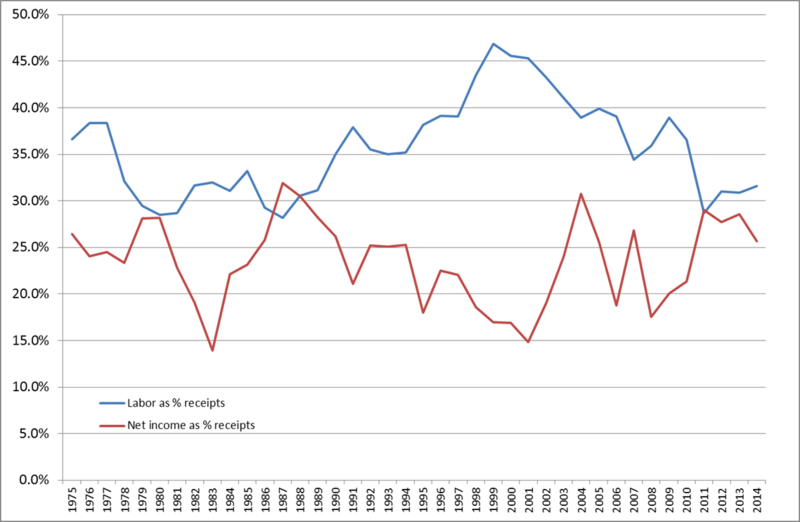 The response from opponents to the benefit-cost report is both predictable and a little bit strange. Someone from the Department of Water Resources criticizes it for not using the "declining baseline" of water exports, and the pro-tunnels group "Californians for Water Security" says that we "fail to acknowledge economic losses of future water cutbacks without project." This criticism stems from the fact that I followed their documents. In essence, they are saying that a good analysis would make stuff up that is completely inconsistent with the official documents the WaterFix has created to support its applications for regulatory approval. It seems that in the opinion of Californians for Water Security, and Department of Water Resources' spokespeople, an unbiased benefit-cost analysis would make the following unsupportable and speculative assumptions. Future environmental restrictions on water exports can only affect the no-tunnel scenario, and that the WaterFix is somehow immune. If future environmental restrictions were to reduce water exports, it would have no environmental benefit to society, only costs to water exporters. Both of these are false, and addressed in the report. Any reasonable argument to support the first assumption went away with the change in the proposal from BDCP to WaterFix. Water operations could decreae in the future in response to environmental conditions and regulations with and without the WaterFix. The benefit-cost analysis correctly focuses on the incremental change in water supply with and without the tunnels. There is no reason to believe the incremental supply with and without would be any different even if future regulations are tighter. The second assumption that these potential environmental regulations would only have costs but not offsetting environmental benefits is simply false. But this is a silly debate with media spokespeople. There is only one reasonable response for project proponents. Follow your own guidelines and repeated promises, and complete your own benefit-cost analysis of the WaterFix that is integrated and consistent with the environmental documents. In fact, one of the goals of doing this report is to put some pressure on the state and project proponents to put their benefit-cost analysis on the table like they promised to do last year. Then we could compare the assumptions, the points of consistency and inconsistency with the environmental documents, and have a real informed discussion about the merits of the WaterFix proposal. Earlier today, the Center released a benefit-cost analysis of the California Water Fix. Last year, state officials said they would release their own benefit-cost analysis in August 2015, but it is now a year later and nothing has been forthcoming. In this analysis, I would describe the "optimistic" scenario as my best estimate of what I think DWR's benefit-cost analysis would look - based on previous work done by their consultants for the tunnels when they were part of the BDCP. The "base" scenario reflects what I believe are more realistic values, and in both cases the WaterFix has benefits that are far less than costs. Since the benefit-cost ratio for the optimistic scenario is so low, it did not seem necessary to consider a pessimistic scenario which would consider possibilities of higher costs or that the tunnels created greater environmental damage than predicted in the proponents' documents. While 23 cents of benefit per dollar of cost is bad, the reality could be even worse. A link to the full report and a summary table of results is below. Present Value of Benefits and Costs of the California WaterFix. 2014 dollars, 3.5% real discount rate, 15 years of construction, and 100 years of operation. The table shows the largest California metro areas ranked by percentage growth in nonfarm payrolls over the past 12 months, and the past 10 years. San Francisco and San Jose obviously stand out. It's interesting that the East Bay's job growth has been quite a bit slower. East Bay has always been a little bit of a bedroom/commuter area to San Francisco and San Jose, but it seems to becoming even more so. Given that it was the epicenter of the foreclosure crisis, and the bottom of these charts not long ago, the recent job recovery in the Stockton-Lodi area is very noteworthy. Sacramento is noticeably lagging behind. In the decade from 1996 to 2006, Sacramento nonfarm payrolls grew by 32%, but only 1.6% growth in the past decade. San Joaquin County in top 10% of U.S. Counties in both job growth and wage growth in 4th quarter of 2015 as the number of warehousing jobs doubles. New data showing the strength of the economic recovery in the Stockton-Lodi MSA continue to come in. Today's release of the Quarterly Census of Employment and Wages for the 4th quarter of 2015 may be the strongest sign yet that this area that was the epicenter of the foreclosure crisis is on the rebound. Over the 12-month period ending in December 2015, San Joaquin County had 4.2% gain in employment (27th best of 343 large U.S. counties), and a 7.1% gain in the average weekly wage (28th best of 343 large U.S. counties). While many California counties were in the top 10% of one of these categories, San Joaquin County was the only one in the top decile of both. Other California counties in the top decile of job growth were Placer, Riverside, Stanislaus, and San Francisco. Other California counties in the top decile for wage growth were Santa Clara and San Luis Obispo. In the table below, I show the 5 sectors that added at least 1,000 jobs in San Joaquin County over the past year. Warehousing is the sector that jumps off the page, as the Amazon driven expansion has more than doubled warehousing jobs in the County. And just recently, Amazon announced another 1 million square foot expansion in Tracy so the number of warehousing jobs will only rise from here. However, these new warehousing jobs in fullfillment centers do not pay as well as the traditional warehouse jobs. Average weekly wage in the sector fell by nearly 15%, and it isn't clear whether this is due to more part-time jobs, lower hourly wages or a combination of both. From the data, it appears the new warehousing/fulfillment jobs average less than $800 per week - which is closer to traditional retail jobs than warehouse jobs - and it is the retail jobs that the fulfillment centers are displacing. Despite the drop in average wages in warehousing, overall average wages in San Joaquin County increased as most sectors reported strong wage gains. It is important to note that the 12 month data shown in this report fits in between California minimum wage hikes to $9 on July 1, 2014 and $10 on January 1, 2016. Thus, there should be little direct effect from the minimum wage increase although some employers may have boosted wages in anticipation of the mandated change. However, much of the average wage increase can also be attributed to significant increases to employment in higher-paying sectors such as construction and government. Is Metropolitan's purchase of 20,000 acres in the Delta a subsidy for agricultural water contractors? For years, I have explained why agricultural water contractors will be unable or unwilling to pay for their proportional share of the delta tunnels (i.e. California WaterFix) and have predicted that urban ratepayers will be stuck with most if not all of the tunnels' cost. Last week, the Metropolitan Water District (MWD) approved the $175 million purchase of approximately 20,000 acres of Delta land, much of it strategically located to support the construction of the delta tunnels. Throughout last summer and fall there were multiple news reports that MWD was having discussions with agricultural water contractors like Westlands and Kern County Water Agency about jointly purchasing the Delta Wetlands property. However, the agricultural agencies decided not to particpate, so MWD decided to go ahead and buy the property all by themselves. Is this a harbinger for how the delta tunnels will be financed? After all, this is likely the largest land acquisition that will be made to directly support tunnel construction. MWD says it has not yet determined how it would specifically use the land. In addition, to supporting tunnel construction, MWD points out that the land could indirectly help water supply reliability through habitat restoration to benefit endangered species that limit delta water exports, and that the parcels were strategically located to facillitate construction of a freshwater path through the delta if a massive levee failure and flood threatened exports. MWD is hoping that uncertainty argument will be sufficient for it to prevail against a CEQA lawsuit, but it doesn't explain the financial rationale for MWD moving ahead without any funds from the agricultural contractors. For all of these potential uses, the benefits would accrue to all of the water contractors who export water from the Delta, not just MWD, and the vast majority of water exported from the Delta that would benefit from these actions is received by farmers. Thus, it seems clear that this purchase is not consistent with the assurances MWD has repeatedly made to its ratepayers that it will not subsidize agricultural contractors share of the tunnels' cost. It also seems like it could be inconsistent with Proposition 218, which requires water rates to be tied to specific benefits received by its ratepayers and that ratepayers only pay the proportional costs of providing those benefits. The fact that MWD initially pursued a joint purchase is strong evidence that MWD believes that its ratepayers are not the exclusive beneficiaries of the $175 million purchase that is now going to be 100% paid for by MWD ratepayers. Is this a preview of how the tunnels themselves will be financed? If the agricultural users back out of paying for the WaterFix as many expect, will urban contractors like MWD move ahead and try to finance the entire estimated $16 billion in WaterFix construction costs by themselves. Even if MWD wants to do it alone, will they be able to? This proposed purchase makes it even more clear why the WaterFix needs to issue a detailed finance plan as soon as possible.